عزتیان, ویکتوریا, اسعدی اسکویی, ابراهیم. (1391). کاربرد روش‌‌های آماری در تحلیل نوسان‌های اوزون وِردسپهری. مجله ژئوفیزیک ایران, 6(1), 42-60. ویکتوریا عزتیان; ابراهیم اسعدی اسکویی. "کاربرد روش‌‌های آماری در تحلیل نوسان‌های اوزون وِردسپهری". مجله ژئوفیزیک ایران, 6, 1, 1391, 42-60. عزتیان, ویکتوریا, اسعدی اسکویی, ابراهیم. (1391). 'کاربرد روش‌‌های آماری در تحلیل نوسان‌های اوزون وِردسپهری', مجله ژئوفیزیک ایران, 6(1), pp. 42-60. عزتیان, ویکتوریا, اسعدی اسکویی, ابراهیم. کاربرد روش‌‌های آماری در تحلیل نوسان‌های اوزون وِردسپهری. مجله ژئوفیزیک ایران, 1391; 6(1): 42-60. اوزون وِردسپهری (تروپوسفری) سبب بروز مشکلات تنفسی می‌شود و پوشش‌های گیاهی را تحت تاثیر قرار می‌‌دهد. در این پژوهش مدل‌‌های آماری براساس مقادیر متغیرهای هواشناختی و آلاینده‌‌های جوّی برای پیش‌‌بینی تغییرات غلظت اوزون وِردسپهری در اصفهان در مقیاس‌‌های زمانی ساعتی و روزانه عرضه شده که طیف وسیعی از مدل‌‌های رگرسیونی خطی چندمتغیره را شامل می‌‌شود. نتایج روشن ساخت که بین تغییرات اوزون و متغیرهای هواشناختی و آلاینده‌‌های جوّی هم‌بستگی‌های معنی‌‌دار وجود دارد لیکن هیچ‌یک از مدل‌‌ها توانایی تبیین سهم بزرگی از واریانس مقادیر اندازه‌‌گیری شده اوزون وِردسپهری در اصفهان را نداشتند. محاسبه یک مدل غیرخطی دومتغیره اگرچه توانست حالت کلی نوسان‌های ذاتی اوزون را نشان دهد، اما به‌دلیل وجود نوسان‌های نامنظم در داده‌‌های ساعتی نتوانست مدلی مناسب برای پیش بینی غلظت اوزون وِردسپهری باشد. بیشتر مدل‌ها نشان دادند که افزایش دما و رطوبت، بیشترین سهم را در تشکیل اوزون وِردسپهری دارند و فشار سطح دریا در تحلیل‌های نقطه‌‌ای دارای کاربرد چندانی نیستند. همچنین افزایش غلظت ترکیبات اکسیژن‌‌دار نیتروژن، تولید اوزون وِردسپهری را افزایش می‌‌دهد. در مقیاس روزانه گاز کربن مونوکسید و دما توانستند بهترین توجیه را برای غلظت اوزون وِردسپهری به‌دست دهند. Tropospheric ozone is one of the main causes of respiratory problems and it hurts vegetations. In this research, statistical models based on a wide variety of regression models are presented in order to evaluate the surface ozone concentrations in hourly and daily scales in Isfahan using meteorological variables and pollutant gases as predictors. Although none of meteorological variables and pollutant gas levels has the ability to interpret the measured ozone variations in Isfahan, the results have shown there is a significant correlation between them and the ozone variations. Calculating a nonlinear bivariate model can show the general ozone fluctuations, but because of irregular fluctuations in hourly data, it can not be a proper predictor. Most of the models assigned the biggest influence to the air temperature and humidity in surface ozone production and declared that the mean surface pressure do not have an important role in the point analysis. Also increasing the oxide compositions of nitrogen increases the ozone production. In a daily scale, carbon monoxide and temperature have presented the best interpretation for the ozone concentration. The aim of this research was to present a consistent evaluation of the surface ozone using statistical methods. At beginning, the society of ozone samples, pollutant gases and corresponding meteorological data was assessed and the correlation between the ozone level and each of them or a group of them was tested, step by step. Most of data did not obey a normal curve, so in different stages, some operations were necessary to make the data closer to the normal situation. In this paper, the data from meteorological and pollution observations were used as predictors. The station was located in 32.62N, 51.66E with the elevation of 1550 m.
b- Meteorological data: air temperature, relative humidity, wind speed, solar radiation, air pressure. Reviewing the time series of the ozone data (24 hours) showed that there was a daily sinusoidal cycle in the ozone concentration and a sinusoidal model can easily calculate the ozone amount as a function of the hours in a day. Although a sinusoidal curve was well fitted to the daily curve of the ozone concentration, random fluctuations in the daily average were seen. These irregularities caused difficulties in presenting a single proper model to show the daily cycle of the ozone concentrations. In the next stage, an equation was gained by modulation of the daily and hourly equations to show the ensemble daily and hourly cycle of the ozone concentrations. Analysis of the results of regression models shows that between the three equation, best equation be gained from step wise method. Then, by using a backward method, 13 equation be gained. All of these equations show that the daily scale can not justify the surface ozone variations. This can be because of the act of other unknown variables or because of the nonlinear nature of the correlations between ozone levels and the predictors. However the data were preprocessed to get closer to a normal distribution. For this purpose, both logarithmic and squared forms of the data were also used eventhough they could not make a considerable change in order to transform the data to normal distributions. All of them were used beside the natural data to form more regression models. It should be noted that the nature of these kinds of data, that needs complicated process to be created, makes the correlations coefficient less strong. The resulted equations in this paper showed that the current operations could not normalize the distributions of the data. The existence of a nonlinear correlation between the ozone levels and the studied variables can be a reason for the weakness of these models. In the previous studies, the highest determination coefficient was 0.36 (Alexandrof, 2005). In this paper, the best equation nearly showed the same amounts (r = 0.304). In the backwards method, a higher coefficient was gained (r = 0.592) but because of the length and size of the equation, it is not usable. Although the regression models and the principal component analysis showed that they had a strong ability to interpretat the surface ozone fluctuations and predict its concentration, the number of their independent variables prevented them from being useful enough from an application viewpoint. بانک اطلاعات سازمان حفاظت محیط زیست استان اصفهان (1384- 1377)،www.esfahan.doe.ir. بانک اطلاعات مرکز اوزون سنجی و اداره کل هواشناسی استان اصفهان سالهای 2004- 1995 میلادی، www.esfahanmetportal.ir. بیدختی، ع. و شرعی پور، ز.، 1386، بررسی تغییرات اوزون سطحی درمحدودة ایستگاه سینوپتیک: مؤسسة ژئوفیزیک، مجله محیط شناسی سال سی و سوم، 42، 63–74. پوی، ه‍. س، رئو، د. 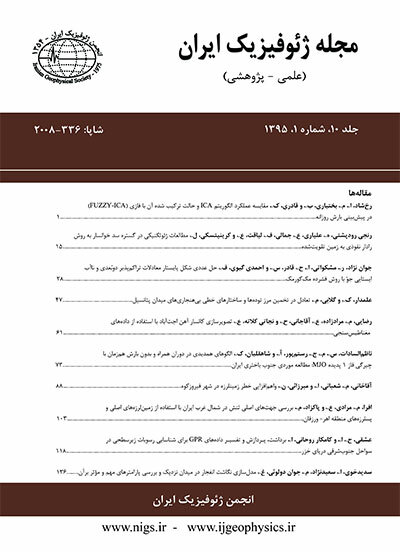 و چبانوگلاس، ج.، 1378، مهندسی محیط زیست (هوا و زایدات جامد)، ترجمة محمدعلی کی‌نژاد و سیروس ابراهیمی، انتشارات دانشگاه صنعتی سهند، تبریز، 2، 53-30. رهبر، م و زندنیاپور، ا.، 1379، تولید اوزون آلاینده هوا در تهران، موسسه ژئوفیزیک دانشگاه تهران. صداقت کردار، ع.، جهانگیری، ز. و رحیم زاده، ف.، 1382، توانایی‌های بالقوه علم آمار درمطالعات هواشناسی آلودگی هوا، کنفرانس آمار دانشگاه علامه طباطبایی، 10-1. طالبی، ه.، 1384، مدل توزیع آلاینده های جوی شهر اصفهان، طرح پژوهشی، انتشارات سازمان حفاظت محیط زیست، 23-17. عزتیان، و.، 1386، بررسی اثرات پارامترهای هواشناسی بر شاخص کیفیت هوای شهر اصفهان، رساله دکتری دانشگاه اصفهان، 32-1. کریمی، م وپرنده، ا.، 1382، بررسی و ارزیابی روند کاهش غلظت اوزون کلی در نقاط مختلف کرة زمین، سومین کنفرانس منطقه‌ای و ملی تغییر اقلیم، 392-381. مولوی، ح .،1379، راهنمای عملی SPSS-10 در علوم رفتاری، انتشارات دانشگاه اصفهان، 85- 79. مقدم، م.، محمدی شوطی، ا. آقایی سربرزه، م. 1373، آشنایی با روشهای آماری چند متغیره. انتشارات پیشتاز علم، 52-32. An Invitation to the Atmosphere. 2nd edition. Wadsworth Publishing, Company, Belmont, California, 314- 336. Alexandrov, A. V., Velikov, S. K., Donev E. H., Ivano D. M. V., 2005, Quantifying non linearities in ground level Ozone behavior at mountainvalley station at Ovannarsco, Bulgaria by using general neural net work stations: Bulgarian Geophysical Journal, 31, 45- 58. Bogucka, B., 2008, High ozone concentrations in selected regions of Poland and their relationship to weather patterns: institute of meteorological and water management, warsaw, Poland,8th annual meeting of the EMS8 / ECAC7,5 , EMS – A – 00461. Debaje.S. B., and Kakade, A. D., 2006, Measurements of Surface Ozone in Rural Site of India: Aerosol and Air Quality Research, 6(4), 444-465. Nolle, M., Ellul, R., Ventura, F., and Gusten, H., 1996, A study of historical surface ozone measurements (1884-1900) on the island of Gozo in the central Mediterranean. Proceedings of Eurotrac Meeting in Garmisch Partenkirchen, Germany. Rahbar, M., 1989 ,Ozone Variability at a Semi rural Site in France, CNRS, Orleans: Proceedings of the Quadrennial Ozone Symposium and Tropospheric Ozone Workshop held 4-13 August, 1988 in Göttingen, Federal Republic of Germany. Edited by Rumen D. Bojkov and Peter Fabian. Hampton, VA: A. Deepak Publishing, 532-534. Reich, P. B., Schoettle, A. W., and Amundson, R. G., 1985, Effects of low concentrations of O3, leaf age and water stress on leaf diffusive conductance and water use efficiency in soybean: Physiologia Plantarum,63, 58-6. Thompson M. L., Reynolds, J., Cox, L. H., Guttorp, P. and Sampson P. D., 1999, A review of statistical methods for the meteorological adjustment of tropospheric ozone: NRCSE-TRS No. 026. Toumi, R.et al, 1994, Indirect influence of ozone depletion on climate forcing by clouds, Nature, 372, 322-323. Xiangdong, Z., 2004, A meteorological analysis on low tropospheric ozone events over Xining, North western China on 26-27 July 1996: Atmospheric Environment, 38, 261-271.